This has been the most empowering moment of my life. My condition doesn’t control me. The only possible solution to treating my condition was Gamma Knife Icon. It was like a ray of light. After one Gamma Knife Icon treatment, I returned to work that afternoon with no side effects. What Does Gamma Knife Icon Treatment Look Like? No two brain conditions are exactly alike. Using the most trusted and accurate radiosurgery technology in the world, Gamma Knife Icon is a game changer for those suffering from even the most complex brain tumors and neurological disorders. Gamma Knife Icon is a noninvasive, frameless treatment requiring no cutting or incisions – helping you to conquer your unique condition differently. Mary Bird Perkins – Our Lady of the Lake Cancer Center is among one of the first treatment centers in the country to lead a new way of healing for brain tumors, brain cancer and many other brain conditions. Discover more resources, qualifying factors and key information to share with your doctor about Gamma Knife Icon technology. Learn more about the patients conquering their conditions differently with Mary Bird Perkins – Our Lady of the Lake Cancer Center and Gamma Knife Icon. Twenty-six year old Donald Hartung and his wife Jennifer, missionaries from Addis, La., said they were sharing the good news of Jesus in Cambodia when he started experiencing some discomfort. When the pain became too much last December, the couple returned to the United States to seek medical help and family support. It was then he was diagnosed with stage IIIC testicular cancer that had metastasized (spread) to his lungs, abdominal lymph nodes and brain. In spite of such an advanced diagnosis, Donald continued to work and minister throughout treatment. His life did not stop and restart, but rather he adjusted to the circumstances. Due to the brain metastases, he started having debilitating headaches, vision changes with eye pain and was nauseous and dizzy. He underwent open brain surgery to remove the tumor, but it was unable to be fully and safely removed. Furthermore, on MRI scans done after surgery, it was clear his tumor was growing back in the surgical cavity and new tumors had also began growing in four additional areas of his brain, and his headaches and vision changes were again progressing. Enter Dr. Daniel Bourgeois, a Gamma Knife Icon – credentialed radiation oncologist at the Cancer Center. He delivered Stereotactic Radiosurgery (SRS) with the Gamma Knife Icon, a highly accurate and non-invasive outpatient radiotherapy procedure that requires no cutting, stiches, anesthesia, etc. Donald only needed to lie still on a table for several hours. He said he thanks God he only had to wear a custom mask to hold his head held in a steady position while the state-of-the-art machine treated the tumors while leaving his healthy brain tissue intact. In the past, it was required that a frame be surgically attached to the patient’s skull during the procedure. After the Gamma Knife Icon treatment, Donald returned to work that afternoon without any side effects. His headaches, dizziness and vision changes began subsiding over time. The brain makes us who we are, so eliminating the tumor without harming healthy tissue didn’t impact any of Donald’s abilities, memory, cognition or personal characteristics. He says it was such a blessing to have such a quick and successful treatment. Donald has now completed all of his recommended treatments, including chemotherapy, and all of his scans now appear clear with no evidence of disease, meaning no cancer in sight. He and his wife have since continued their ministry at their home church and are now looking forward to a future with children and embarking on their next mission adventure in the years to come. Throughout the ordeal, Donald said he was never scared or nervous, but had a peace that surpassed all understanding. In fact, many were surprised by his lack of emotional response at the diagnoses. Donald says he knew his life’s calling had not been finished and thus it wasn’t the end. He was told he had cancer, but cancer never had him. At 10-years-old, Louisiana native Eric Von Aspern was diagnosed for the first time with a brain tumor. Thirty years and four surgeries later, Eric found himself with continued issues stemming from the meningioma, a benign brain tumor, and the continuous damage it was causing to his vision. As a video production manager and avid snowboarder, Eric relied on his vision for his profession and personal hobbies. While doctors were able to remove most of the tumor through surgery, a small amount still remained near the optic nerve. Eric’s doctors recommended Gamma Knife Icon as an alternative solution that could pinpoint the affected brain tissue, accurately and precisely, while leaving the healthy tissue — and the optic nerve — untouched. Choosing Mary Bird Perkins – Our Lady of the Lake Cancer Center for the procedure enabled Eric to receive the most effective treatment in his hometown. “They make you feel so welcome. The way the team worked together was beautiful,” he says. His experience with the physicians, staff and technology exceeded his expectations. 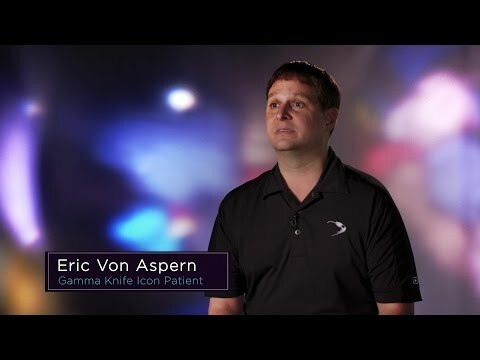 With the Gamma Knife Icon, Eric’s treatment was entirely frameless, replacing the traditional screwed-in-place frame with a warm, moldable mask uniquely customized to his head for stability throughout the procedure. “The machine itself is almost silent, and the treatment only took 45 minutes. It was completely painless,” Eric explains. Eric went to the Cancer Center on a Wednesday morning and was back to work by lunchtime. While the treatment was simple and successful, the weight of what was on the line for Eric was extraordinary. Yet throughout his journey, he never lost hope that he would find an answer. Ana Kristof had experienced severe pain for more than 20 years of her life after being diagnosed with trigeminal neuralgia. Responsible for transferring sensations from the face to the brain, Ana’s trigeminal nerve was being compressed by an artery, leading to what many consider “the worst pain known to man.” The condition led to relentless electric shock-like feelings across her face that would come without warning, lasting for several seconds at a time. After undergoing two brain surgeries, the pain had not subsided. As a self-proclaimed “prisoner in her own home,” the disorder stopped her from having the life she wanted, down to simple freedoms like cleaning the house or going to the grocery store. For comfort, she looked to her son. Often putting his own life on hold to be her caretaker, he continuously provided the level of comfort she needed to continue her journey for a cure. Ana’s condition was so severe that some doctors feared there was nothing that could be done to fully resolve the pain. Ana was on the verge of losing hope when her neurologist recommended Dr. Renee Levine, a radiation oncologist at Mary Bird Perkins – Our Lady of the Lake Cancer Center, a facility close to home and equipped with the Gamma Knife Icon. “Dr. Levine is truly so empathetic and cares about her patients so much. When I was worried, she always reminded me that she was just a phone call away,” Ana says. Dr. Levine took on Ana’s case, consulting with other doctors and presenting it at tumor conferences across the nation, to ensure the finest care was provided throughout the process. With the help and support of Dr. Levine and the Cancer Center team, Ana successfully had treatment in October 2016. Unlike traditional surgery, Gamma Knife Icon doesn’t require cutting or incisions and the precise radiation ensures healthy brain tissue is unaffected by the treatment. Pain relief can occur immediately or over a period of weeks – even for more severe cases such as Ana’s. Since the procedure, Ana’s life has been transformed. With the success of the Gamma Knife Icon treatment, Ana has achieved more than she ever thought possible. She enjoys time with her grandchildren and solo camping trips outdoors – pieces of her life that she never thought she could get back.